As part of Queensbury’s 250th anniversary celebration, the Chapman Museum has opened a new exhibit, Queensbury’s Boom: from Country to Suburb. The exhibit explores the post World War Two development of Queensbury from a rural township to a bustling community. Using materials gleaned from archives at the Chapman, the Queensbury Town Historian, Crandall Public Library Center for Folklife, History and Culture, and the Warren County Records Center, the exhibit features the history of early housing tracts such as Cottage Hill, the first shopping centers on Upper Glen, the Queensbury school, the Warren County Airport, and popular tourist attractions that sprang up along Route 9. To set the scene, the exhibit starts with early 20th century views of the Queensbury landscape before it was transformed by the development that followed. Rarely seen photos depict dirt roads winding through farmland and the sand plain that once stretched from the Glens Falls city limits to the foot of West Mountain. Family photos, promotional pamphlets and site plans document the new neighborhood developments that were built after World War II to meet the demand for housing. 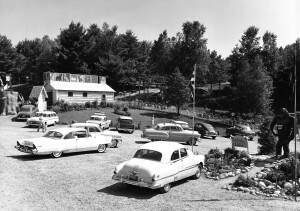 Advertisements speak to the growing popularity of the automobile in the late 1950s and early 60s as Northway Plaza and other stores were built to cater to the desires of driving shoppers, and Storytown and Animal Land opened to provide summer entertainment to vacationers. 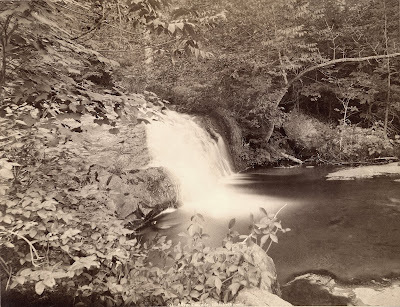 This exhibit is part of a new effort to collect material that documents the history of the Glens Falls and Queensbury area in the mid-20th century. Two photo days, held at the Queensbury Center in June, started the process of seeking out images currently in personal collections. The exhibit continues that effort as it provides opportunity for people to contribute images of their own experiences to the story of Queensbury. The exhibit will be open through January 6th. The exhibit is funded by grants from the Town of Queensbury, the Waldo T. Ross &amp- Ruth S. Ross Charitable Trust Foundation, and the Leo Cox Beach Philanthropic Foundation. The Chapman Historical Museum is located at 348 Glen Street, Glens Falls, NY. For more information call (518) 793-2826 or visit chapmanmuseum.org. 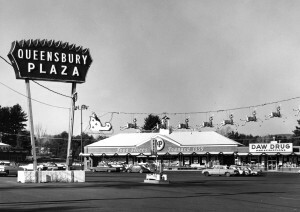 Photos: Above, Queensbury Plaza, Upper Glen Street in the early 1960s- Below, Animal Land, Route 9, circa 1960. Photos provided, courtesy Dean Color.